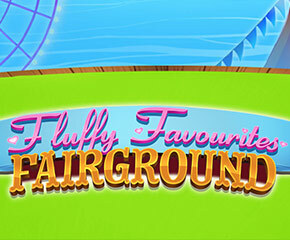 Fluffy Favourites Fairground is a 5 reel 25 payline slot by Eyecon. As the name suggests, the slot has a theme with cute fluffy animals. So, these are the symbols that mainly dominate the reels. After the success of Fluffy Favourites slot, Eyecon carried forward the cute fluffy theme with some more exciting features in Fluffy Favourites Fairground. The slot theme is really cute and brightens your mood since the start. The background pictures the green land and the tents in the fair. The symbols include the cute fluffy panda, lion, turtles, rabbit, giraffe and pink elephant. Pink elephant acts as the scatter as well as the wild substitute of the game along with the Big Top Symbol. Keep an eye on the pink elephant as this can land you a winning combination. If you get this scatter in a pay line, you will win double your payouts. There’s an Autoplay feature, which gives you a chance to play up to 100 games in a row. To play a game you start the bet with 10p and can increase the stake up to £50 per spin. Fluffy Favourites Fairground offers exciting free spins and bonus features. The scatter symbol of the slot – a pink elephant will award you free spins and multiplier. Land 3, 4 or 5 of this scatter and you will get 15, 20 or 25 free spins. Other than free spins, the free spins feature also gets you 3x multiplier, which will triple your wins. The best part is that you can re-trigger the free spins feature up to 15 times and will get the chance win you as big as 400 free spins! Want to try to pick a toy? Land 3 or more claw symbols and unlock the toy box pick feature. You will be taken to the classic display where you have to catch the cuddly toys. Each of these toys can award you up to 100 times your total stake. The next winning symbol is hippos. Land 2, 3, 4 or 5 of the hippos and win 10, 100, 500 or 5000 coins. Purple dragon can win you up to 1000 coins. The pandas and the monkeys are worth up to 500 coins while lions and tortoise will get you up to 300 coins. 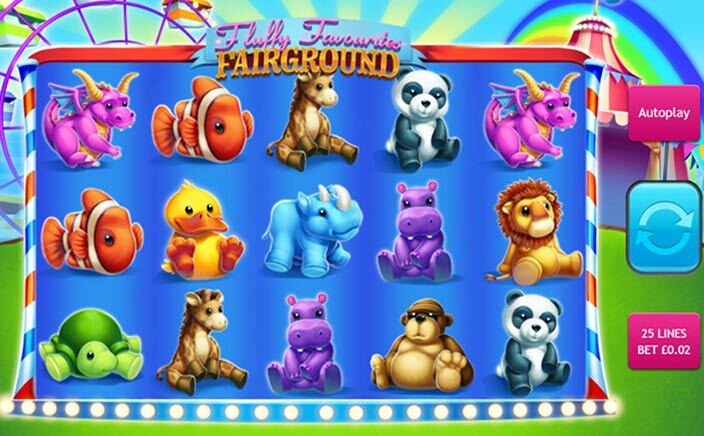 Fluffy Favourites Fairground is a fun slots game with a bright theme and cute cuddly plush toys. And each of the toys is worth a few hundred coins. The maximum you can win in the slot 5000 coins, which is a really good payout.